Leading football clubs, players and managers have united this month for the fifth annual Know the Score campaign to raise awareness of bowel cancer signs and symptoms. Every 90 minutes three people in the UK die of bowel cancer - the second biggest cause of cancer death - and research has shown early diagnosis is key to survival. 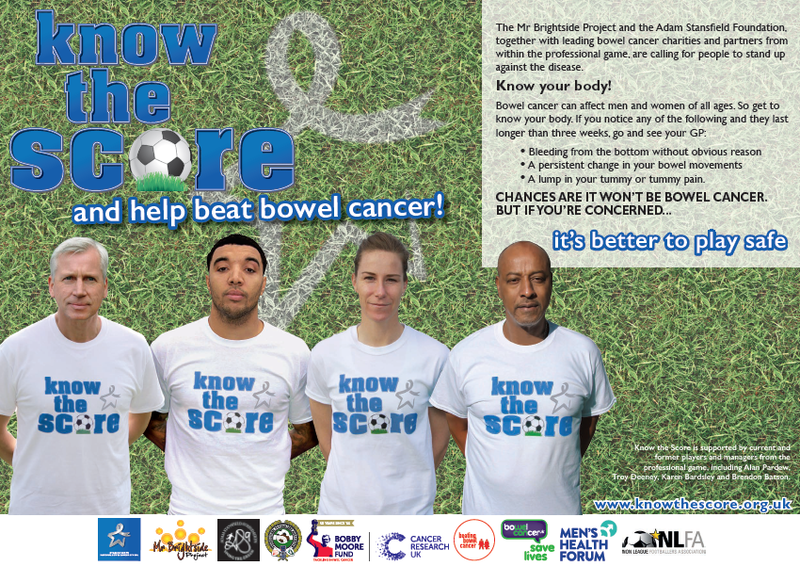 To help raise awareness several leading cancer charities have joined forces with the Professional Footballers’ Association (PFA) and League Managers Association (LMA) to promote Know the Score during April, which is Bowel Cancer Awareness Month. 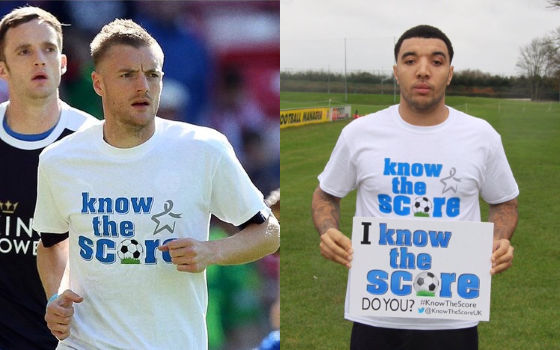 More than 70 clubs are backing the campaign, which kicked off last weekend as top players such as Jamie Vardy (above, left) wore Know the Score t-shirts as they warmed up for games, whilst managers including Claudio Ranieri (right) and Alan Pardew wore the campaign’s ‘Star of Hope’ badge. Watford striker Troy Deeney (above, right), who is an ambassador for Know the Score, said: “I would urge anyone who thinks they may have symptoms of bowel cancer to visit their doctor as soon as possible. Thousands of ‘Star of Hope’ badges will be distributed to support Know the Score, which is the brainchild of former Millwall, Charlton and QPR goalkeeper Nicky Johns, who lost his son Stephen to bowel cancer in 2009, aged just 26. Along with Deeney, Crystal Palace boss Alan Pardew, England women’s goalkeeper Karen Bardsley and PFA trustee Brendon Batson are official ambassadors for the 2016 campaign, which is supported by the UK's leading bowel cancer charities, including Beating Bowel Cancer, the Bobby Moore Fund and Bowel Cancer UK. Know the Score ambassador Karen Bardsley will be talking to Club Website in April's edition of The Clubhouse - our grassroots football newsletter. Make sure you don't miss it - sign up here. Know the Score on bowel cancer and be aware of symptoms - click the poster to enlarge.